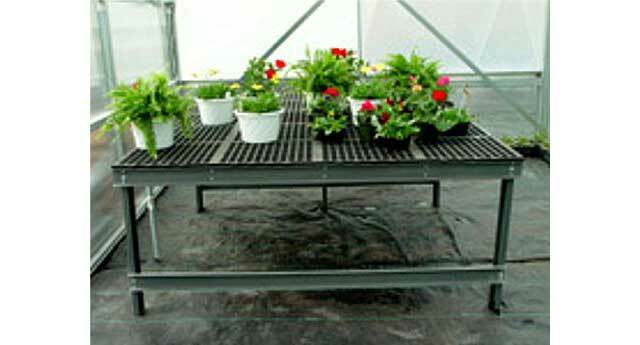 The Benches Systems and shelving can maximize plant growing and retail nursery space in your greenhouse. Gothic Arch Greenhouses provide heavy-duty greenhouse bench tops feature open mesh design to allow maximum air and light penetration. Choose from a selection of fixed benches or rolling benches, metal bench tops, potting tables, galvanized maintenance-free bench systems, and high-capacity greenhouse benching. Several potting bench styles are available including AV-Liftime Greenhouse Benching, Benches on Wheels, AV-Grow Bench Kits, Expanded Metal Bench Top Panels, EZ-Grow Continuous Greenhouse Benches, and more! Grow Bench Tops: Bench Top is Designed to replace traditional wood, metal and wire bench top, Dura-Bench offers a tougher, longer lasting growing surface while eliminating problems associated with other bench top materials. 1.5" x 1.5" Galvanized Wire Mesh Rolls: Bench Mesh rolls are 1.5 square mesh in both 12.5 ga. and 10.5 Ga. Wire and are available in 24", 36", 48", 60", 66", 72" standard widths and in 100' lengths. Rolls may be installed on wood or metal bench frames with lengthwise or cross supports. 1.5" x 1.5" Vinyl Coated Mesh Rolls: Bench Mesh rolls are 1.5 square mesh in both 12.5 ga. and 10.5 Ga. Wire and are available in 24", 36", 48", 60", 66", 72" standard widths and in 100' lengths. Rolls may be installed on wood or metal bench frames with lengthwise or cross supports. Standard colors are Green and Black. Other colors and widths are available as special request. Deposit required for special orders and other charges. A-V Lifetime Benches: The A-V Lifetime Bench Systems utilizes bench tops and fiberglass frames, which is available with permanent or removable legs. Standard widths 18", 24", 36", 48", 54", 72", 90" and 96" in lengths up to 12'. A-V Greenhouse Bench Tops: The A-V Greenhouse Bench Tops are molded of tough polypropylene material, you will find they are very long lasting, non-corrosive, easy to clean, lightweight and very user friendly. Sizes available are 18" x 36" and 24" x 48". These tops can be used on any bench new or old. Each section has reinforced premolded fastener holes and is secured with self-drilling screws. These bench tops are UV protected. A-V Rolling Greenhouse Benches: The A-V Rolling Greenhouse Bench is sleek, easy to roll, adaptable to your requirements, and reasonably priced. The Rollin Bench includes A-V plastic bench tops, fiberglass top supports on 24" centers, 2 - 1.33" galvanized rollers (optional), and telescoping fiberglass stands on maximum 8' centers. Available in 4' increments in depths of 6' or 8'. Shipped Unassembled. Dura-Bench Original: Greenhouse Bench Top is Designed to replace traditional wood, metal and wire bench top, Dura-Bench offers a tougher, longer lasting growing surface while eliminating problems associated with other bench top materials. Dura-Bench Ultra: The NEW Dura-Bench Ultra Greenhouse Bench Top was designed to replace traditional wood, metal and wire bench top, Dura-Bench Ultra offers a tougher, longer lasting growing surface while eliminating problems associated with other bench top materials.